Our creative in the current issue of Ritz-Carlton’s magazine features the market and one of our favorite local delicacies… Ackee! Down in the sunny Cayman Islands there is an abundance of exotic and unusual fruits and vegetables growing. From cassava to winged beans, the produce on the island is used in many different ways unique to the island and its culture. 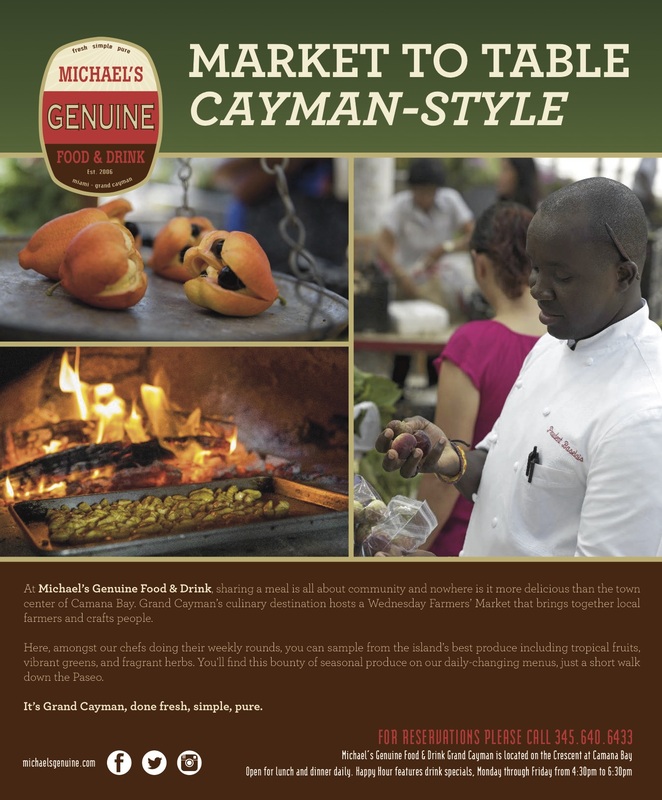 The Camana Bay Farmers Market is held every Wednesday just steps from Michael’s Genuine Food & Drink in Grand Cayman. It is a great place for locals, tourists and our chefs to find all of the island’s local produce and is a snapshot of what’s in-season and what you can expect to be on your plate at the restaurant at any given moment. Chefs Michael and Thomas have taken turns visiting the island over the past couple of weeks to find the farmers market and its growers as vibrant as they’ve ever been, with fresh ingredients in abundance such as boniato (sweet potato), bitter melon, plantains, heirloom tomatoes, jujube apples, coconut, pumpkin, okra, passionfruit, and ackee to name a few. It’s always a huge source of inspiration… Case and point, you’ll now find this ackee toast on the menu! The breadfruit is a perfect example of this local bounty. A species of flowering tree in the mulberry family, breadfruit originated in the South Pacific and was introduced to Caribbean islands during the late 18th century by British and French navigators. Today it is grown in some 90 countries throughout Southeast and South Asia, the Pacific Ocean, the Caribbean, Central America and Africa. The breadfruit is so common you can typically find the tree it grows on in every Caymanian backyard and is a staple in every local’s household. With the texture of a potato and the flavor of freshly baked bread (hence the name breadfruit), breadfruit can be great for baking, roasting, grilling, frying, or boiling. In traditional Cayman cuisine, the breadfruit is usually boiled or fried and seasoned with spicy pickled vegetables. Chef Thomas Tennant is a master at handling this curious-looking ingredient, and created the perfect expression of its best qualities in the breadfruit salad. The breadfruit is roasted whole in the wood oven, peeled and cut into large chunks, then re-roasted to nice and crispy outside and creamy middle. While you may not have a breadfruit tree in your backyard, we have seen them from time to time pop onto the ingredient wall at our Miami restaurant food bar, or sitting pretty above the pastry station. We challenge to to your own breadfruit treasure hunt… This could be your reward! Using a chef’s knife, remove the stem of the breadfruit by coring out the stem. Then insert the knife straight through the breadfruit, at least half way into the fruit via the stem side going through the breadfruit center, then do it again but turning the knife to create and ‘X’. You will have pierced through the breadfruit but not cutting all the way through it. Score the other side with an ‘X’. Place the breadfruit on a sheet pan and roast in the oven for about 30-40 minutes. After 40 minutes, check for doneness by piercing with a knife, it will be done if you can pierce the breadfruit every easily, similar to a baked potato. Once cooked, remove from the oven and allow to cool. Once cooled, cut away the outer skin, then cut into one inch cubes. Place the breadfruit cubes on a baking tray, season with salt and pepper to taste and toss with the olive oil. Roast in the oven for about 8 minutes or until the breadfruit begins to brown and become crisp. Meanwhile, combine the tomatoes, avocados, scallions, basil and arugula, in a mixing bowl, season to taste with salt and pepper. Once the breadfruit has become crisp, combine into the mixing bowl with the other ingredients and dress with the citrus vinaigrette. 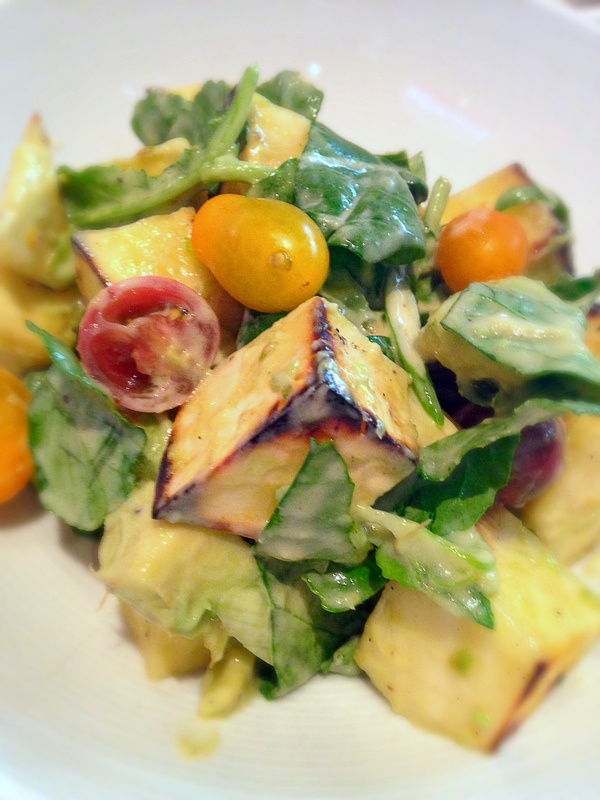 Adjust seasoning and serve immediately while the salad is still warm. Zest the citrus with a microplane zester into a container, then juice the citrus. Combine the citrus zest, juices, egg yolk, vinegar, honey and salt in a blender. Blend on medium-low speed for about 20 seconds. While the blender is running, slowly incorporate the oils by adding them in a thin but steady stream into the blender until all the oil has been emulsified. Transfer to a clean container and refrigerate.